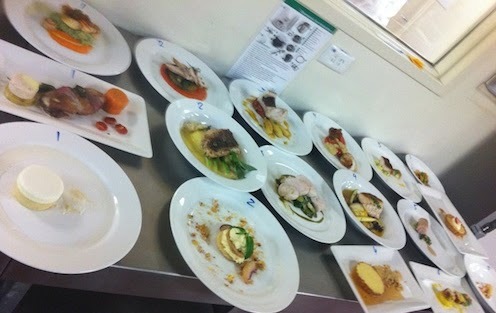 On the morning of Saturday 24 March 2012, I had the privilege of being a tasting judge at the Western Australian round of the La Chaîne des Rôtisseurs Jeunes Commis competition. Basically, the Young Chef’s competition, open to junior professional chefs. 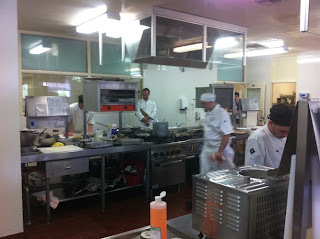 The commercial training kitchen at Challenger Institute in Fremantle was abuzz with activity as things kicked off at 8.30am with the briefing and the unveiling of the “black box” of compulsory ingredients (and in case you were wondering, this format has been going on for years before popular TV caught onto it). 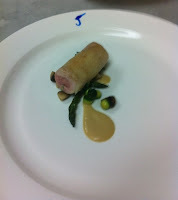 The six competitors had to prepare a 3 course meal for four persons over the course of the morning: half an hour to create their menu and three and a half hours to produce and plate it. Their creations had to include the compulsory ingredients, which included a whole fresh snapper, a whole chicken, pernod ricard, hazelnuts, peach and saffron. They would be judged on their actions in the kitchen – such as preparation, methods, cleanliness – and of course on the food they served up – for example presentation, taste, texture, uniqueness, among other factors. The clear winner of the day was Blake Gossop of Petit Mort, who was presented with a Rôtisseur medal, a cash prize of $300 and an autographed copy of Neil Perry’s Rockpool cookbook.. Yes, a far cry from buckets of cash or your own cooking show. But it’s not about the material rewards (although I suspect that Blake considered the cookbook to be the most valuable prize of the lot) – it’s about the recognition and the glory. Blake will now represent Western Australia at the Australian national stage to be held at the Tropical North Queensland Institute of TAFE on 16 June 2012 during the Chaîne des Rôtisseurs Grand Chapitre in Cairns (14-17 June 2012). 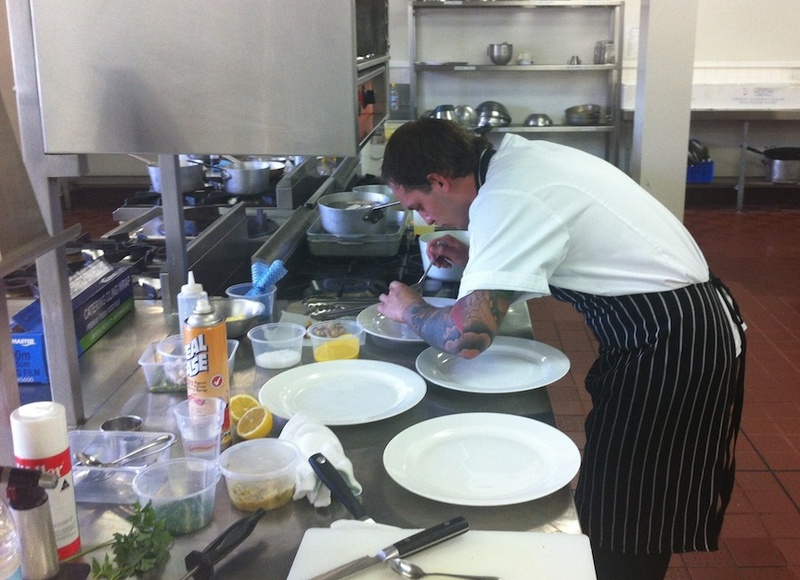 The winner of the national stage will then go on to represent Australia at the international Jeunes Commis competition in Berlin, Germany on 14 September 2012. 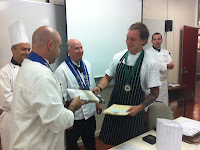 Travis Simmonds of Burswood Resort took out second place and Danny Hoyes of Fort Mandurah Key Resort took out 3rd place. All competitors acquitted themselves admirably, with Chaîne WA Vice-Chancelier Chef Graeme Shapiro remarking that the standard across the board was higher than the already high standard set in the previous year’s competition. It is worthy to note that after Blake, the other competitors’ scores were close to each other, although all of the judges were unanimous in their decision on the first 3 places. Of special note was Wayne Watson’s (of Harvest Restaurant) beautifully light and fragrant saffron broth; Mitchell Hill’s (of the George Street Bistro) expertise in deconstructing a whole chicken in under a minute and the skill and care evident in Jonathan Khin’s (Jackson’s) creations. Before the winners were announced, each judge provided some useful feedback to the competitors, for example Maître Rôtisseur Chef Soren Koberstein’s remark that it would only have taken 20 minutes to prepare a fish stock that would have imparted a richer flavour to the snapper dish. 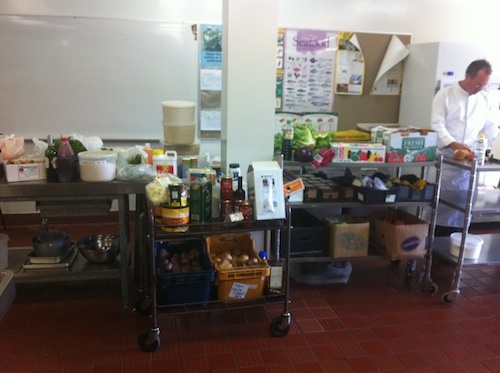 The competitors then went back to their respective restaurants to prepare for the busy Saturday evening trade. It is a testament to their dedication to the advancement of the culinary art that they spent their precious Saturday morning competing in the Jeunes Commis. Special thanks must go to Vice-Conseiller-Culinaire Chef Phil Westwood and Challenger Institute Fremantle for providing the venue, and of course all of the veteran chefs who voluntarily gave of their time to be kitchen judges and tasting judges, including Chef Sean Marco, Executive Chef of Restaurants at Burswood Resorts, Chef Marco Bijl, Chef de Cuisine of the Atrium Restaurant, Burswood Resort, and Chefs Michael Canavan and Gerhard Steiner, training chefs at the Challenger Institute, Fremantle. And just in case you were thinking that being a tasting judge is a glamorous and easy job – imagine having to taste, judge and score 24 separate dishes within the space of an hour! Talk about speed eating. And no, this wasn’t a wine tasting, so there was no spittoon either – it would have been a travesty to spit out all that delicious food!